Chatting with The Future Heart, Bubba explained all. “The heart of Juggable Offense is an exploration of what I can do with a Moog Guitar, a big modular synthesizer, and – in the future – some modified looping devices/sundry other effects. It’s all trying to be evocative, interesting music using tools that inspire me in a really profound way. The music and the tools used to create the music are in a big way inseparable for me. And all of this stuff was an accident. I started working on making music solo because I wanted to find people to play with, and I thought the best way to do that was to play shows solo, but then I ended up spending the last three years developing it solo and still haven’t found people to play it with, so it kinda became it’s own standalone project very naturally. Juggable Offense is just me and my machines. Basically for The Fearless Coward I started by recording the entire thing live – one take – in a big room in Detroit. The guitar and a couple of lead synth lines I played live, as well as the synth bass on everything except most of “That One Song From The Piano.” The rest of the base was sequenced and recorded in that session. When we did the mixing, Miles [ Butterfield] – who I’m also in a band with – suggested adding a few small overdubs, so I added a little bit of synth to a few tracks and a guitar overdub to “That One Song from the Piano Pt. 3.” I added the drones and quasi-rhythm guitars to “Ding Dong the Batterwitch is Dead” at that point as well. I consciously tried to make as much of the focus as possible be on the live take, and I think – hope – the overdubs reflect that. Throughout The Fearless Coward we hear guitar lines that fuse ’60s psych with shimmering shoegaze, all of which works well against the pulsing synths. “This is one of my favorite technical parts of my musical life,” Bubba says of his guitar sound. As it turns out, it’s the result of acquiring Eurorack modular synths and experimenting with them for the past couple years. “The way I got into it was by ordering a bunch of modules that were specifically chosen to process the Moog Guitar. I wanted to get into Eurorack because it seemed like the best way to create an effects rig for the guitar that was as complex as the instrument itself deserved. So, without having ever seen a Euro system in person, I bought all these modules, distortions, waveshapers, filters, an echo, a really awesome looper, and some other stuff, and I immediately knew I had found what I was looking for. For a while I stopped using pedals at all, because every sound I wanted I could get out of the modular effects rig I had put together. The distortions [for almost all the songs on The Fearless Coward] are either a Moog Minifooger Drive pedal or a pair of modules by Flight of Harmony and Doepfer that I connected in parallel, which is super easy in the modular. The echos all come from the Make Noise Echophon, which not only sounds incredible but is also tempo-syncable, which is a Godsend. The reverb is also a Make Noise module, the Erbe-Verb. It’s where I get all the 80’s shimmery things as well as the kind of percussive stuff on Scenes. All of that goes through a Fender Twin, and that’s it! 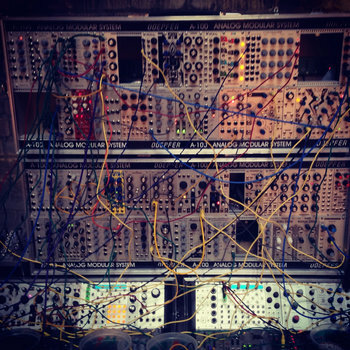 “At one point, the whole modular – synths, drums, and guitar effects – was four huge cabinets plus a few more smaller racks,” Bubba explains, “but I’ve since gotten it down to two big cabinets and two significantly smaller ones. I’ve not yet had any significant issues gigging with it. A couple times I’ve screwed up the patching, which always makes for a fun moment in the middle of the show, because I’ll just start playing hammer-on heavy solos with my left hand while furiously trying to patch with my right. But the modular itself has been great. I was recently rear-ended, and my two main cases took the majority of the hit and thankfully not a single issue has popped up in any of the fifty-plus modules. It can take a little while to set it all up, but if I’m on my game I think I take just about as long as most rock bands for their setups. Of course, guitar tone is only as relevant as the compositions it’s expressing. “I feel very strongly that instrumental music needs strong melody,” Bubba says, “and the strongest melodies are melodies you remember. All of the songs were written basically by screwing around until I found something I remembered and then putting some chords and such underneath it. The same mentality applies to The Fearless Coward’s vivid track titles – each setting the scene for the music like “program music” does in the classical world. “It’s instrumental music, but it’s all evocative of something, so I gotta give people a nice idea of what it’s all supposed to be about,” Bubba says. Which raises another question: how were these pieces written? “Some of the sounds are completely accidental,” Bubba says, “the percussion on “Scenes” for example. I bought the Erbe-Verb and was just goofing around, CV’ing the different parameters when I discovered that feeding it stepped random voltages from the Make Noise Wogglebug made that ultra weird, gated percussion thing and knew I had to use it. Other things, like the little spastic video game lead in the latter part of Ding Dong came from seeing a really awesome use of a couple of Make Noise modules – the Wogglebug and Rene – and trying it out for myself for that tune. Usually the guitar melody comes from jamming with a sound. So I’ll patch up some combination of modules and mess around with it, and if I remember what I played, I go back to it and try to build a form around it. My formal music training is limited to maybe three years – total, spread way out – of instrumental lessons on piano, bass guitar, and saxophones. A lot of times as I’m hashing out the melody I’ll start adding in bass parts and see what makes sense to play underneath what I’m already playing, and that can have a pretty big effect on the final product too. Mostly though, it starts with a heavy dose of noodling and grows into something with more form over time. The end result is a sound that can be summed up as “psychedelic,” but what exactly does that mean? For Bubba the term refers to two aspects of music: the journey and the sound. “The journey is where the music takes the artist and the listener,” he explains. “The sound, for me, means something sonically or performance-wise really grabs the listener or performer. I played a gig in a thrift shop with Ralph White a few weeks ago and he played a bunch of songs on this really wild five string fretless banjo, and I was absolutely transfixed by it. The instrument evoked all these really interesting things in my mind. So yeah, psychedelic music is music that takes me on a journey and/ or has really rad sonic things going on with it that push me as a listener into new places. Listen to Juggable Offense at juggableoffense.bandcamp. Follow Juggable Offense on facebook, twitter and instagram. erbe verb, wogglebug, echophon and rene. Details on Juggable Offense’s Moog guitar is here.